Storm of Life Project is within Kochogo North Sub-Location, Kochogo Location of Nyando District in Nyanza Province in Kenya. 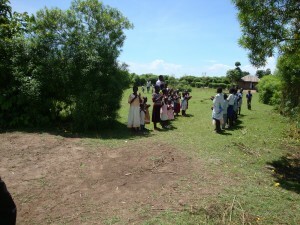 At the Location, John and Getrude have two small temporary classrooms. Close to this location, John and Getrude started a small farm for the cultivation of vegetables. The harvest has been used for own consumption and the extra production has been sold on the market. The total location is 2 ha.